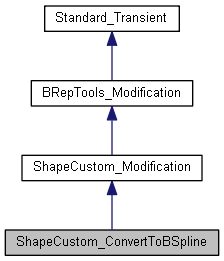 implement a modification for BRepTools Modifier algortihm. Converts Surface of Linear Exctrusion, Revolution and Offset surfaces into BSpline Surface according to flags. Returns the continuity of <NewE> between <NewF1> and <NewF2>. <NewE> is the new edge created from <E>. <NewF1> (resp. <NewF2>) is the new face created from <F1> (resp. <F2>). Returns Standard_True if the edge <E> has been modified. In this case, is the new geometric support of the edge, <L> the new location, <Tol> the new tolerance. Otherwise, returns Standard_False, and , <L>, <Tol> are not significant. Returns Standard_True if the edge <E> has a new curve on surface on the face <F>.In this case, is the new geometric support of the edge, <L> the new location, <Tol> the new tolerance. Returns Standard_True if the Vertex <V> has a new parameter on the edge <E>. In this case,. , <Tol> are not significant. Returns Standard_True if the vertex <V> has been modified. In this case,. Returns Standard_True if the face <F> has been modified. In this case, <S> is the new geometric support of the face, <L> the new location, <Tol> the new tolerance. Otherwise, returns Standard_False, and <S>, <L>, <Tol> are not significant. Sets mode for convertion of Surfaces of Linear extrusion. Sets mode for convertion of Offset surfaces. Sets mode for convertion of Plane surfaces. Sets mode for convertion of Surfaces of Revolution.